This past weekend we mentioned we’d be creating a few recipes for family friendly titles. 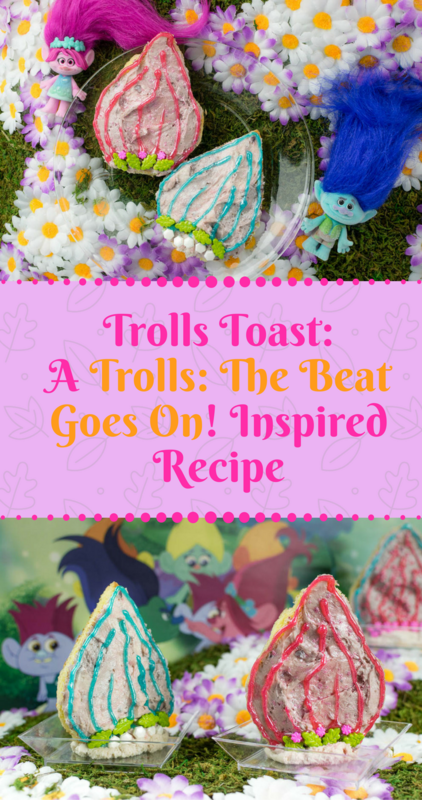 Up next is a recipe inspired by Trolls: The Beat Goes On! 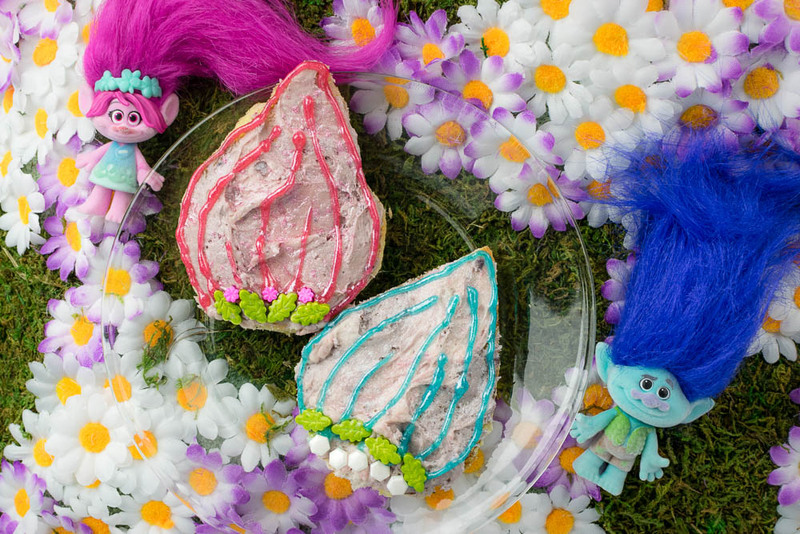 We really loved the Trolls movie and the Holiday Special, so when we heard that Netflix and Dreamworks were creating a show, we knew we wanted to create a recipe! You wouldn’t believe how many Trolls inspired recipes already exist! However, we didn’t find a recipe for what we felt was obvious, toast! That being said, we’ve got a fun new recipe, Trolls Toast! The inspiration for this recipe came from not only Poppy and Branch’s appearance, but also the show’s theme song Hair Up in the Air. We knew we really wanted do create a recipe that looked like hair but didn’t use cotton candy. That’s when the idea for toast came in. 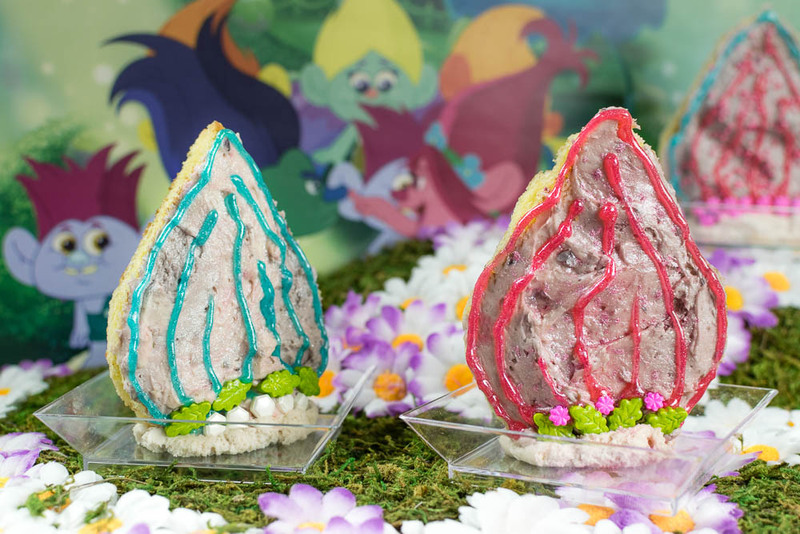 With unicorn toast and mermaid toast being super popular, we figured that Troll Toast could totally be a thing! What’s also fun about this recipe is that it is completely customizable (especially with all of the variations of sprinkles available)! Brunch will be way more exciting with fun, glittery, decorated toast! We hope you enjoy our recipe for Trolls Toast! Be sure to check out Trolls: The Beat Goes On! now on Netflix! Allow time for your cream cheese to soften a bit. To achieve a marbleized look with your cream cheese add a few dollops to your bread and then gently spread to knife. Add decor and more pearl dust as desired. To stand up on a plate, apply a bit of cream cheese to the plate and place the toast in it upright. *The Geeks were not compensated or given any comped items to facilitate this write-up; Opinions and recipe are wholly our own. Images were used with permission. All opinions are wholly our own. View our Disclosure Policy for more info. These are so fun and creative! What a great idea, especially for kids (and adults) who love the Trolls movie! wow this is so cute and creative perfect to surprise the kids at home and even a birthday party. You really capture teh essence of the characters great job! OMG this is so cute. I would be the BEST GRAMMA in the world if I made these next sleepover weekend. These are so cute! You think of the most amazing unique recipes. Love your creativity! Oh my these are so cute.. My kids love the movie Troll!! They would love these.. Saving for later. My kids LOVE trolls! They’d think they were in heaven if I served up a troll themed meal! As it is, they pretend they’re Bergens, and their food is trolls. It’s kind of gross how they savor their food, but I’ll take it if they’re eating their veggies/trolls! This is very cool and fun recipe for kids who like trolls. I will share this with my friends that I know their kids are very interested in trolls. I just love this idea…so cute and creative for the little ones! How cute to make the toast in the shape of a troll. That is so creative!! I bet youngsters would go wild over it. Well, gee I think I’d like it too. These are totally fun! My daughter would love to eat toast in the shape of her favorite characters. My kids love trolls movie. I think I can surprise them your recipe of troll toast . Best part is that you used cream cheese spread with strawberry and blueberry which is also kids favorite. My niece would love this. The next time she is over I’ll have to make this with her. She loves the Trolls.